Today, with a press release and a family photo, Swedish Royal Court announced that Princess Madeleine and Chris O'Neill plans to move to Florida. 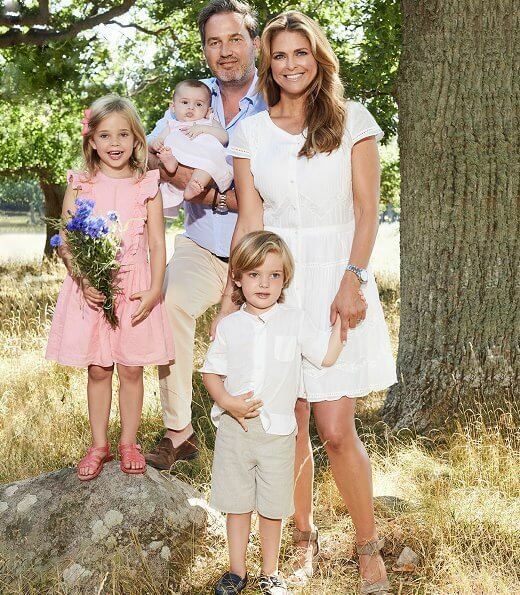 In the press release, it is stated that the children of the couple are still in the preschool period and that this is a chance, that Princess Madeleine will continue to work with World Childhood Foundation and that Chris O'Neill will continue to carry out his businesses in Europe. It is also stated that the programs of the family in Stockholm will not go wrong. The children are super cute.Leonore all in pink. Madeleine's dress is just right for the summer.Good Luck to them on their move to Florida. Eine bezaubernde Familie - das Foto ist perfekt in Farbe und Ausdruck : Schade , dass Madeleine jetzt so weit weg von Ihrer Heimat Schweden leben wird ! Irgendwie verständich , bei den Verhältnissen da !! "the programs of the family in Stockholm will not go wrong." <- What does that mean?? Does this mean the kids will no longer be in the line of succession for the throne? I thought they had to live/be educated in Sweden to be eligible. The constituion says they should be rised in Sweden. The royal court missapropriate of this to say that this means that the children should go to school in Sweden. So at their eyes, all free children deserve royal titles. I believe they will live there while Leonore is in preschool. When she starts regular schooling they will probably move back to Sweden.I am just surmising on what has been said in the past. I think Leonore will not go to school in Sweden. Madeleine will do whatever she can for the kids to have royal titles. The court will continue to find excuses on why she never returned home. Madeleine is the youngest. She's always been spoiled and given her way with whatever she wants. I agree that the court is making excuses for her now. Yes, that is something Swedish gossip press loves to write -- that she's spoiled, used to get whatever she wants, -- but if Madeleine is that smitten with royal titles and importance of royalty, then why Chris is private person and not HRH Prince Chris. Wouldn't that have been fancy?? But no, Chris O'Neill is like any other husband who earns his own money..why is that always conviniently forgotten? Karl I agree on that. Chris earns his own money and doesnt want anything from the royal family. I respect him very much. But thats his decision, not Madeleines. Madeleine is not a only spoild one. Carl Philip and Sofia are very spoiled too. They barely ever work and take the priviliges. Madeleine probably works more with childhood that Carl Philip and Sofia work for Sweden. Maybe its time to cut the appanage in general. Actually no Raquel. Wether you want to admit it or not, Carl Philip and Sofia do work hard for their Prince Couple foundation and Project Playground. Yes, Raquel Alves, I agree. I watched Victoria, Carl Philip, and Madeleine grow up (pre-Internet!). Madeleine was the "rebel". She went to London, then to New York, then back to Sweden, then back to New York, then London-Stockholm-London-Stockholm - well, you get it. She doesn't want to be a princess but loves the perks she gets. And yes, Chris is British-American and Leonore is Swedish-American; but still, whatever Madeleine wants, Madeleine gets. I recall she was her father's favorite child. Why move to Florida now only to return to Stockholm in a year or so for Leonore to attend a Swedish school? I'll be surprised if they move back to Sweden. Excuses will be made for her as per usual. Perhaps they wanted one last chance to live abroad before Leonore starts school? Are we all then spoiled because we decide/choose where we live?? What if Chris got good job offer that gives him financial security and their move allows Madeleine to continue with her charity work with Childhood? But they are prisoners of Sweden thus not allowed to decide for themselves? Besides its not like Madeleine is the only royal who has lived abroad. I disagree that Madeleine gets whatever she wants. Besides wasn't Carl Philip his father's favorite child?? Karl yes Carl Philip is well known to be the favorite. Blair What evidences do u have? Evidences say otherwise. The official calender marks 14 workdays for Sofia (at the moment) in the hole year. many of which gala dinners. Project playground is run by people that replaced Her. The court said she as of 2015 would not work actively in it. She has a charity with CP now. No Raquel I'm talking about them specifically with their Prince Couple foundation and Project Playground. You implied that Madeleine works harder with the Childhood organization and that's just not true. As for all the other stuff they attend, it's not much but at least they're going. None of them are really "working hard". Sofia doesnt work for PP since 2015. Madeleine's work with childhood is not publish on the official calender. However its public knowledge that Madeleine has a office in the childhood headquarters. Photos etc of the office and Madeleine herself are public. I dont think that CP and Sofia work more for their charity than Madeleine for childhood. Karl and Raquel; no, Madeline was the favorite one. King did want at first Carl Philip to keep being crown prince because he was born so, when the new succession law was pending to take his tittle and make him just a prince. I can see king´s point there actually. Other ways Madeline was always the favorite one for both parents. If she was not, she could never have left behave like she did as younger. How do you know Madeleine was the favorite one? Have her parents or siblings said so? I recently read story about QSilvia and it claimed the same thing but how they've come to that conclusion, no idea. Even Madeleine staying with her mother when she was rushed to the hospital during the Christmas was presented in a negative way. For me it looks like Q and CG have spent time with all their children. Victoria as the future queen seem to get a little special treatment, e.g celebrating her name day and birthday bigger, her children more visible. Raquel; of course Sofia still works to Project Playground. She is not in board anymore, only honorable chair of the board, but that does not mean she is not working to it. We have actually seen several pictures even here of her work. I do not know much about World Childhood Foundation, but the office of it is in New York. That is almost 2000 km from Palm Beach Florida. Little hard to believe she could work effectively and lot to Childhood really. Both these charities are of course admirable and I am happy they spend their time for them. They can't to be able to make up their minds where to live. The U.S., Britain, Sweden.........I see a divorce in the future. This family has been relentlessly persecuted by some Swedish media. I would guess it's pretty impossible for them to live in Sweden. They have three children to protect. A wonderful picture of the family. Could one of the reason for the move back to USA be because of Brexit……… Chris is working with investment ? Mille, I also think that it is due to brexit. London is losing its status as THE european financial place. A lot of banks are already closing their headquarters in London and move to Frankfurt/M. in Germany for example or to Bruxelles. So this decision is good for Chris and bad for Madeleines children, as for questions of line of succession, acceptance of swedish people and so on. As Gabriella said, there might be a divorce in future. The Swedish tabloid press is very critical and unkind toward Chris and Madeleine. I hope they can escape some of that in the US. The children are beautiful and Leonore's dress is adorable and a beautiful color on her. "Critical and unkind"... maybe they have reason to be critical? or indeed about any individual at all? I've never seen anything like it. They should have sued the rags long ago. The same rags who won't write about all the misbehaving and shadiness, criminal or not, among other members of SRF. Yes, Lisa Mo. Agree. It almost seems like a vendetta. There are plenty of other shady areas for the tabloid press to target, but Chris and Madeleine are favored prey. I remember early on, right after their wedding, Chris did make a few motions toward suing the press. But he did not. However, since then, it's been very negative coverage. You mean Chris' non existing economy... They don't even own a place to live, ffs. Are you all this easy to dupe?? Me, Chris works with his brother in law who happebs to me a very wealthy man. Chris doesnt have a business of his own, he works in business. He has a job in his brother in law's company. So he necessarly have his own "economy". @ME, only you commented on Chris' great economy and he's such a good businessman. There were just comments he wanted to continue as private person and concentrate on earning his own money. You don't have to be millionaire to keep up your family...nor own property when you don't plan to stay put for longer time. Or what? But ME know so well his financial situation and what kind of properties (or lack of them) he owns. Are you his bookkeeper? Raquel, I think you misunderstand with purpose that company-tittle thing. Swedish royals can have companies, parts or whole. Problem is Chris is working as full time employee in his brother of law´s company (as you wrote). That is not permitted. He could have his own company and be a prince, no problem. Also to be Swedish prince he should have gotten Swedish citizenship, what he did not want. He cannot be Swedish prince if citizen just to USA and UK. Daniel and Sofia are both of course Swedish citizens. Members of the Royal Family may be the owner or co-owner of a commercial company. Nor are there any constitutional obstacles to the royal family to own shares or part of the company. The royal family is however restrictive when it comes to engaging in commercial activities. Even King Carl Gustaf owns shares of various companies, Daniel owns still the shares of his gyms which he bought when he founded them and worked there as a ceo, Carl Philip own shares of his company CPhB Design and Bernadotte & Kylberg. They get dividends from their shares. Sofia has at least dormant company. The court gave also a press release in 2014 telling that Madeleine owns 5 % of the shares of three of Chris's companies. Blondinni it is imoral. Plus CP is one of the CEO's of is business companies. Madeleine no longer has that shares. Once it become público she was forces to sell them. Daniel gets money from his business company (pre victoria) but doesnt run it. What u say must be understood with a grain of salt. Immoral??? Really? I think it is that only to you. In one comment you whine how much they cost to Sweden, the next how immoral is they earns their own money. Also you keep telling how shady their business things are, when they are not. In Sweden basic business information is always all public. The only one who has had dark business in this Swedish punch has been Chris with her daddy´s Lichtenstein secret accounts and own Bahama companies. But to my great surprise him you keep plain hero. Let´s add here that to me it is rather indifferent where Chris keeps his money or do or do not he have them. I wish just all the best to this family. Raquel, Carl Philip owns CPhB Design, where chairman of the board is Axel Calissendorff, CP is not siting on board and to my knollage there is no CEO at all. That company owns part of Bernadotte & Kylberg's designs, where Oscar Kylberg is CEO, Carl Storåkers is chairman of board. CP is runing that business with Kylberg but that does not mean he is another CEO. Again no CP on board. Maybe you can tell me where CP is CEO? What comes to law issues, they are really taken literally, there is no other way, that is the main reason for a law. Of course it is imoral. They are royal and private at the same time. They receive money privaty but still recrived appanage as if they work for the country. Also they have close relationships with politicians So they can influence them to benefit their companies. You cannot stop, can you? If these people where as mice in mouse hole you were still telling us how immoral their lives are and keep trowing these "facts" what have no base in factuality. Especially these Swedish ones. The whole Swedish Royal House costs 1,40 € per capita in year in Sweden. As a comparison Royal House of Luxembourg costs 21 € per capita in year, almost 30 times as much, and I have never seen such a accuse with them. But these Swedish ones, o´boy! Why are you following them when you are so full of envy and venom against them? Only the king, Queen and Victoria get straight apanage. CP, Madeline and Sofia get compensation only when they work to Royal House. I think that is fair. The bigger the Royal House comes, the more they are and should be allowed to work, also to save public money of course. I am sure in future there will not be anymore that rule they cannot work full time. In history Swedish Royal House have been even too small, so small there were hardly any spare heirs. I haven´t heard any public aid their companies have got, maybe you kindly tell us about it more. Again these things are all public in Sweden. Also it would not be possible nowhere to forbid all business from people who know a politician. There would be no business or politicians left. I am still also waiting to know where CP is CEO? It's a beautiful family and they all look good and nicely dressed for the Summer. Leonore is a gorgeous beautiful child. I hope they have a great life in the USA away from all the Swedish criticism. It's truly fascinating how you all keep commenting on Chris' great economy and how he's such a good business man, etc. Chris' so called business is only existing because of the financial help from the d'Abo relatives. This was seen in leaked financial statements. And even if the receipts hadn't been shown, the pure fact that the family is basically homless and living nomad life moving from one rental home to the next, should be evidence enough. There is no such thing as a millionare without real estate. Now they are forced to move to Florida to a house that is only partially owned by Chris. A house they've listed on the market for several years. But of course, the rent and living costs are only a fraction of those in London. But Florida might as well be Siberia, don't think for a second that a swedish princess could be happy in the swamps..
Chris joined his brother-in-law’s company after he was made to leave Noster Capital. His clients were unhappy about the press intrusion in his life. The company has already started long ago before Chris joined in July 2013 after marriage. We didn’t know their company’s financial situation, it might already be in bad condition long before Chris came in. What I am saying is, Chris may not be the culprit, the one who made losses to the company. Well, if I am a potential client, I will not want to do business with the husband of a Princess. All these press intrusion chased all the clients away. I work in finance, privacy and confidentiality is very important for all clients. Well anyway, its sad if his business is not doing well, but we have no right to discuss, it is a Private ltd Co.
As for Madeleine, the fact remains, she is no longer needed as well as her children. So being lazy, spoilt or cherry picking, all these are not important anymore, she is suppose to go away, that is the plan, that’s happening right now. If Madeleine is supposed to go away, why was her children bestowed titels? When Leonore was born, she was the only spare in her generation together with Estelle. Her uncle Prince Carl Philip was not married yet and nobody knew at that time whether he was going to get married. Carl Philip did mention in his wedding speech, he and Sofia had an unstable on-off relationship, so his family wasn’t sure about what plans he had. There were also worries about Victoria having difficulties getting pregnant because of Daniel’s health issues. He got a kidney transplant before his marriage in 2009. He is going to need another transplant in the future, when, we don’t know, but this kidney he had gotten from his father is not going to last for a long time. Actually, I think King Carl Gustaf has a lot of worries in his head, Victoria and the succession issues( during his time, he and his old uncle were the only two left in the line of succession). I really think he keeps Madeleine because of Victoria and he trust his own daughter more than his daughter-in-law, Sofia. BTW, the Swedish govt is already in the process of shrinking this RF, it is starting up a committee to decide who are the ones remaining in the royal house. This was reported quite recently in the papers. Madeleine’s role in Sweden is no role at all, she is no longer needed as there are so many spares in front of her. I sincerely hope Madeleine won't (be) cut off completely and she will return to her duties when her children are a little older, and this move is only temporary before she moves back to Sweden for good. She's the reason for me to follow the SRF, and there are others who enjoy seeing her. Besides nothing can change the fact that she's princess by blood. Me and Esther; I had myself no idea that company Chris is working as a director is making so poorly, but you are both right. Wilton Payments Ltd has been doing loss several years in row now and his brother-in-law has pumped years money to it to make it still work. That was news to me really. I had of course heart about his tax-problems before. I red other royal pages and impact to interesting news, they said the estate we assume they move to, the one owned partly by Chris and what has been on sale for a long time, was never taken away from sale and is in Zillow under contract to be sold? What do you think, did Chris buy it or are they moving to somewhere else? I think Leonore has already helped her parents in deciding whether she is going back to Sweden for her eduation and upbringing. She is the imperfect royal child who doesn’t like to be photographed, cannot stand and cannot sit still, she takes after Madeleine. Madeleine is the youngest, she can never work more than her siblings, she is suppose to work lesser and eventually fade away in the future. This is how all royal families operate in the long run, the younger siblings cannot outdo and outshine the oldest, the heir to the throne. Victoria and her family is the future and Carl Philip is the spare. I guess both of them may have already known that their 3 children will be removed from the line of succession. Leonore is like plenty of normal children. I can't even begin to imagine that her parents made a decision to move because she is "imperfect"!! She's a little girl with a personality of her own. Good luck to them - lots of people move and live in different countries, it doesn't mean they are about to divorce. I also don't see how it is an indication of being spoilt. No indication as to how long the move is for so they could move back for the children's schooling eventually. They are such a cute family!! Madeleine is GORGEOUS and I love little Leonore, she's so feisty and fun!! I'm sure Nicholas and Adrienne will follow suit!! Can't wait for someone else in the family to have another baby so I can watch more fun antics from Madeleine's "little rascals" at the christening!! Madeleine grew up a princess, of course she caress about royal titles. If not then she would have renounced her title. Chris wanted the glamour and recognition of being married to a princess. Members of his family are married to royals also and Chris wanted that too. I believe he honestly thought he could balance being a private person married to a public person, but then soon realized he couldn't. There's always rumors that Chris is struggling with his business and I believe this move is for financial reasons. But these two warrant the criticisms of themselves. If Chris wanted to be a private citizen, he wouldn't do things like use the royal chauffeurs when he's on business trips in Stockholm. Or Madeleine wouldn't just show up for the glamorous tiara and high profile engagements. Wether Madeleine likes it or not, she is a princess. Press criticism and paparazzi photos are part of the "job". Running away from Sweden every chance she gets is ridiculous. If she's so unhappy the renounce her title and truly live a private life. She claims that the King won't let her, but I think that bs. If my child were suffering, I would do everything possible to help her, so either the King is being selfish or someone is lying. In the end i do think that their children will be removed from the line of succession. Or like Gabriella said, they'll divorce and Madeleine will go running back to Sweden. But all this snubbing royal life is ridiculous. They just want to have their cake and eat it too. Do you really believe that its that easy to renounce the title,and the media would leave them miracoulously at peace...the press would still hound her, title or no title. Perhaps, if she were fat and ugly ... but the way she looks, no way she's left at peace till next generation gets older and more interesting! Its also ridiculous claim Chris O'Neill married Madeleine because she's royal princess! If he were that into royals/royal life/titles we wouldn't have this problem in the first place - he would have been then HRH Prince Chris and worked next to Madeleine. He wouldn't have to worry how those gossip magazines ruin his reputation. Please remind me do we have HRH Prince Chris?? Bingo! DOUBLE BINGO!! TRIPLE BINGO!!! Blair, you nailed it. Other than that, beautiful photo of Madeleine's family, except that Chris is peeking out from behind the other four. I love Leonore's dress. Interesting insights @Blair. You describe so well and eloquent what I was just experiencing from pictures on this Blog. I am one of those who are mainly interested in fashion and don't read other royal news. But pictures can tell a lot! I do wish this family all the best wherever they go, whatever life they choose. I think the concept of royal life is somewhat outdated anyway. At least when it comes to those far away from the direct line to the throne. I subscribe your words 'You cannot have the cake and eat it at the same time'. Well first off he would have been made a duke not a prince. Karl K like I said. Chris thought he could balance not having a title himself and being married to a public person. He always stated that he didn't want a title. I honestly believe that, but he didn't think things through about what it meant being married to someone who does have one in a active royal family. To complain about the press and paparazzi when you're dating a royal and saying you want privacy is ridiculous and naive. It's just common sense knowing that your privacy will be invaded. He saw early on when they were dating what it would be like. So yes, I do stand by my comment that Chris wanted the glamour of being married to a princess but not the actual "work" of being a royal himself. If Chris wanted that glamour life he would become a prince. He let it very clear he did not wanted to. He wpuld be a prince and a duke (of too dukedoms) why saying he wpuld be just a duke? So not true. He could gain swedish citezinship and royal titles like everyone else. In that case, Sofia that participate in tv since a young age, is she too wanting glamour? Wasnt she a glamour model? Make your mind. I agree Blair in many things, I have also got a feeling Madeline wants just to pic cherries from royal duties, never do everyday work. And it is useless to tell Swedish press only wants it look like that, because Swedish people and press have given her multiply opportunities but they all seem to end the same way. Madeline has ordinary work events, gets flu or something to avoid her seduce, but by miracle is the same even well enough to go out with her friends. With kids she seems little by little getting adult, but still she has never any ordinary royal work, only tiara events. Of course she is now in maternity leave and avoiding obligations is more permitted, but their kids grow and we will not see her work more even then. I think most of Swedish would be fine if she would give her and her kids princess tittles and enjoy being just private person, but this picking cherries make people frustrated. Also moving around makes Swedish people think Madeline has time to every other country but her own. I think also that Chris did keep it more simple to be private citizen with Madeline and got unpleasant surprise later. Also just like Blair wrote, it would be easier to Swedish people keep him private if he did not enjoy royal privileges. About moving to Florida, I also think there are much more economical issues what is told. I am sad about Leonore, to move around globe makes you feel you are everywhere not at home. That must be hard for a hyperactive child. I got a feeling their royal press person had no idea of the move and had to make up explanation fast, that is why the explanation sounds invented. Probably most of royal spouses have to feel some satisfaction with royal glamour and if not like, at least get to used to publicity. That is fine to me. Just look Maxima, Letizia, Meghan etc. also Sofia. They all make glamour to work to their positions not against it. Catherine does not seem to like it but she can stand it. I very much doubt any royal spouse could stand her/his position if all glamour and publicity things were totally no-nou. I am also sure Chris does like the idea of princess as a wife. Her mother went out with prince Charles, sisters did marry kind of glamorous tittles. I know well Raquel how much you dislike Sofia and like to slander her, but even you cannot deny she has made good effort to Carl Philip. She is now with a small child, in maternity leave. But I know to you would be only acceptable view to see her work 24/7 in factory line, nothing less is enough. About Chris not having a prince tittle and his business was not about business generally but about what kind of business with money speculation he is doing. He felt he can do it better without prince tittle. It was his own conclusion, the king would have given him a tittle if he wanted. And he was sure right about that. The reason I said she he would be a duke is because that's what the court said at the time of their engagement. It was asked by the press, and their answer was he could become a duke. Last comment was cut off. It was asked by the press, and their answer was he could become a duke. If he wanted to receive a title. Obviously he did not. If I am wrong on that then I will admit it, but that's what I remember. My mind is made up Raquel, don't start nitpicking little issues just because I dared to disagree with you about Sofia. Because we all know how you feel about her. You are the one that said she only wants glamour So I made a very good point. Perhaps too good for you. There is no reason he couldnt be a prince if he had chose to be one. To said he had no choice therefore he not like he didnt chose the eqsy life, its false. He did had a choice. Royals dont have maternity leave. That comes from taxes. It is common sense that some time is taken off work of course. But that doesnt not justify this very low numbers. Children, event small, should not be used as an excuse for not working. This is true for ALL royals. I miself think Kate is taken too ling to get back to work. Raquel your comment was very difficult to understand, so many mistakes, but in Sweden princess and prince has equal right to have mother, father or parent leave as normal people. We have been talking about that many times before. Law is very clear in that. You do not need to do any paid labour for that. I presume thing are like that also in UK. Sometimes it is very hard to understand how hard presumption some writers here put to royal women when they have small children. Raquel you made a very good point about what? "Perhaps too good for you". Seriously, I don't have a clue what you're talking about. I'm still referring to Chris and Madeleine. Blair if Madeleine just wants glamour than what does someone that was in Fact a glamour model? Very good point. Blondiini, its called a auto correct that in Fact tries to correct (wrongly) any foreign words into my national language. Very annouiyng. The law says in Sweden as well I actually checked as well that in order of one to have maternity/paternity or any leave, they must pay taxes. Thats were the money come from. You pay taxes and when u need u will received it. In the anual court reports where is no info on leaves but about others thinks like extra money received in connection to weddings etc. Otherwise royals are obligated to report to govermemt about the extra expenses. The same for wedding or any extra money. Raquel I still stand by my opinion. Yes, I believe Madeleine just likes the glamorous tiara events. As for Sofia, of course she likes the glamour too, I never said she didn't. I think that's part of the fantasy of being a royal. But she's not specifically just showing up for only the tiara events. She still goes to other engagements even though there's not many. I know you strongly dislike her but surely, you could at least admit that about her. But this thread wasn't even about Sofia. There wasn't even a reason to bring her into this. (I do not know), but I think even they would have right to it. Also to children's allowance. Also people who have never had any incomes get some money with these leaves. I do not know correct word, but all people are withing public social insurance (Försäkringskassan) and that pays it. What is related to incomes (not taxes) is the rate of payment parents get on their leave. Here is link to Försäkringskassan side where it is told. Link is unfortunate long, but gets you to right page so you can stop talking nonsense about this thing. I am little bit tired to dig out these links to you, you should really seek first the information before you so vigorously tell us your desires as facts. Yes, I surelly admite that she is better than Charlene of example. Charlene just doesnt work for Monaco. At least Sofia does minimal work. But lets be honest, its pretty minimal. Is Madeleine an ungrateful and greedy person who only wants to eat the cake and does nothing for Sweden? Is Chris the guy who loves the glamour of marrying a Princess because he is just doing what his sisters are doing, marrying into noble families? Well, we don’t know them and what’s exactly happening behind closed doors, no one will ever know. If the people of Sweden wants answers about Madeleine, her real reason why she remains a Princess and also about her children, then the King should answer to them. Actually, I think if they are not returning to Sweden, it is the best and wisest decision for the children. Leonore will not have an easy time living in Sweden, she will be forever compared with Estelle and we already know what is the outcome. Agree the girls would be compared. It would not be Leonores life. Such a beautiful and cheerful picture of the princess family. Esther Lin and Blair seem to know all about the workings of the Swedish royals, or they just love to spread gossip and innuendos....hmmm...and comparing the little girls, tacky. Stating your opinion is not "spreading gossip". And go back and read my comments I never compared anyone's children. @Blair, and your opinion is based on...what? Unless you know them personally, then on the basis of gossip papers&mags? Are those reliable I ask? If yes, then Victoria and Sofia are both pregnant (Victoria for the xxth time) and Madeleine and CHris ONeill divorcing...sometimes it feels they are in some kind of persinal vendetta against her for daring to spread her wings and not staying in the same place from birth to death 😱 but then if their ancestor hadnt moved to Sweden centuries ago, Swedish history would have been totally different then...but he moved. Karl K, an opinion is how you personally feel about a certain situation or subject. Blair, sorry but I just dont agree with your negative thoughts/ideas and expression about Madeleine. Media has portrayed Madeleine as someone beautiful but beauty = shallow and spoiled, used to get what she wants. But we have no way of knowing how things really are. I'm sure after Jonas betrayed her, she grew up fast... Why Victoria try to hide her beauty? So she would be taken seriously? Its kinda sad to see but perhaps Madelein should also start to wear hair in severe tight buns and dress in dodo clothes? It also looks people forget Madeleine is not the crown princess, nor the spare. So this means she has less responsibility than the heir and spare. She has choosen to concentrate on Childhood and her young family, especially now they have to find engagements for Daniel and Sofia. Lovely photo, they all look very good. This pic feels summer! Only would have been better if they had toes and hair in pic not cut, but that is only professional opinion. Marianne, okay, I was puzzled how come they publish a pic cut so stupidly. Varfor kopierar newmyroyals kommentarer från Svensk Damtidning - oversätter svaren blandar om lite text och sätter nya signaturer på kommentarerna? Man ser ju tydligt att det är samma kommentarer som redan finns i Svensk Damtidning.